If you are wondering what games everyone is playing - or how to look for quality games to play - the top games lists on the iOS App Store is a great place to start your search because the games that appear there are just that - the most popular titles currently being played. 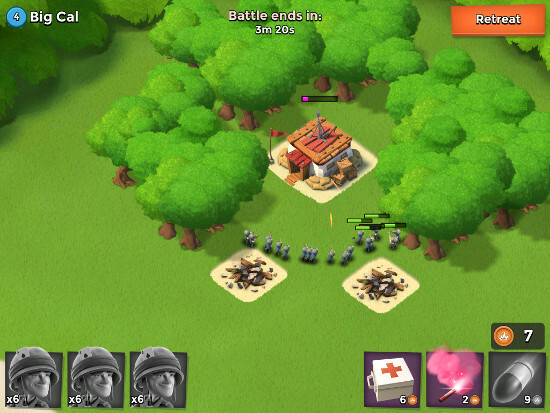 Among those games is this little gem from the same studio that brought you Clash of Clans. 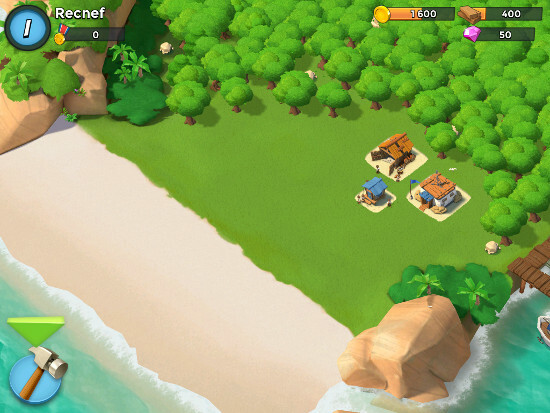 While superficially Boom Beach is like CoC - under the hood and as you go deeper into the game it begins to show off its own very unique identity and show off as an incredibly complex and entertaining game - because while it follows the same basic formula that game studio Supercell used for Clash, at its core it is a very tightly built freemium game whose focus is a combination of base, strategic building, and resource management that compliments its unit-based combat system. 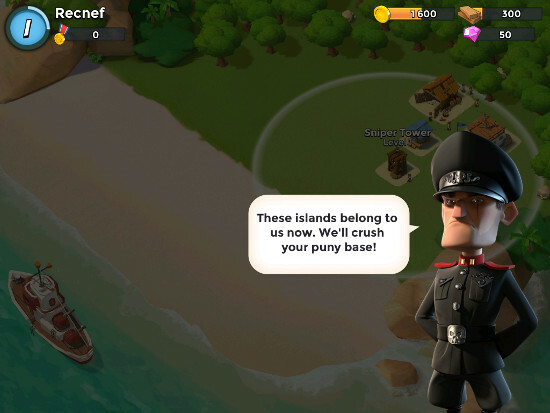 As is often the case with really well-designed freemium games, Boom Beach offers a level of play that allows gamers who choose not to spend real-world money the ability to enjoy full immersion in the title anyway - by trading time and effort and a bit of cleverness - in place of cash. What is more important than that though is the formula that they use to keep game play interesting and challenging - as that is what keeps the players coming back again and again! 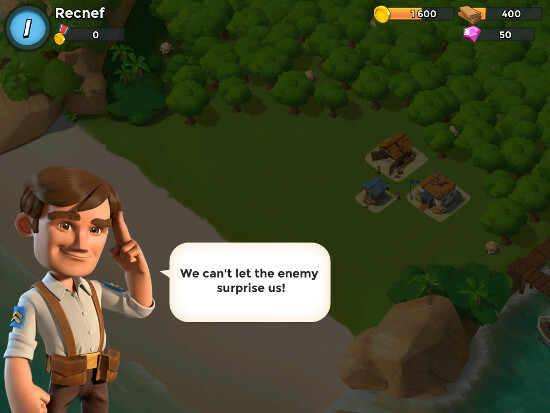 While Boom Beach might be said to be the spiritual successor to Clash of Clans - and that is really a fair statement if we are talking about just the game play elements, attraction, and tightness of design - the experience is similar enough to ensure that players experience the same level of entertainment and fun. Another element that Supercell has gotten really good at is to refine the game play elements in their titles so that the games are easy to learn and pick up - creating a tutorial-based learning experience that does not get in the way of having fun even when first starting out! One of its more interesting elements is the fusion of classic single-player campaign and a passive multi-player approach that leaves the player always wondering if, when they log back into the game, they will find their base as they left it, or has it been attacked, looted, and pillaged while they were away?! 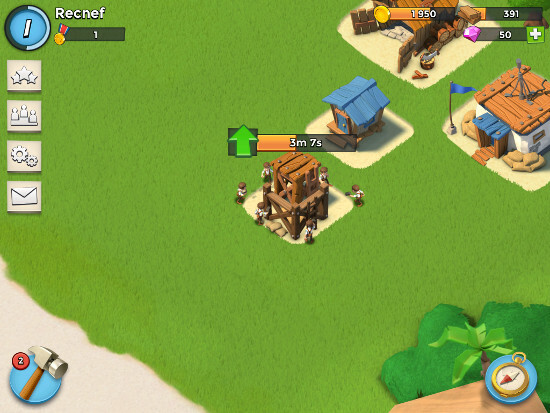 Boom Beach is a free-to-play game - or freemium title - which means you get to download and play it for free. Like most freemium games it has a premium currency which, in this case, is Pink Diamonds - you read that right, Pink Diamonds. 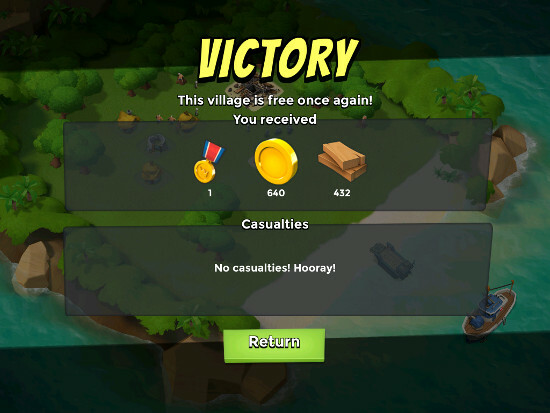 What they do is allow you to eliminate those pesky timers that appear for every action you take, from building to upgrading, and considering the fact that combat is the really fun part of playing in the world of Boom Beach, you are going to be wanting to skip lots of timers - especially the really long ones. 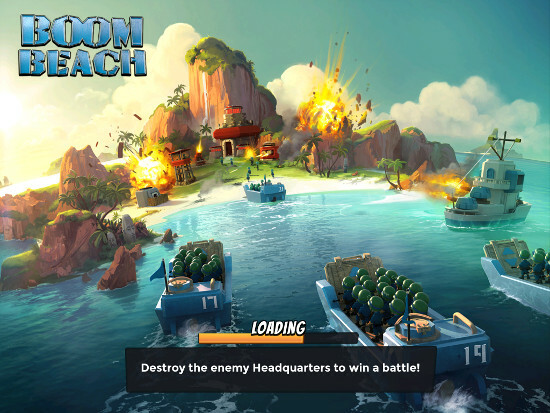 While there is a mechanism built into the game that allows you to acquire a small if regular supply of the Diamonds without having to spend a dime - including re-appearing treasure chests in ocean and on islands that offer a small but reliable influx. The really long timers are expensive to skip, because they require lots of Diamonds - so if you get into the habit of skipping timers and immediate gratification, you might want to remember you also will have to get into the habit of spending lots of money! That said though, if you are a patient gamer who values the results of good efforts put into a great game, there are lots of opportunities for your patience to shine. 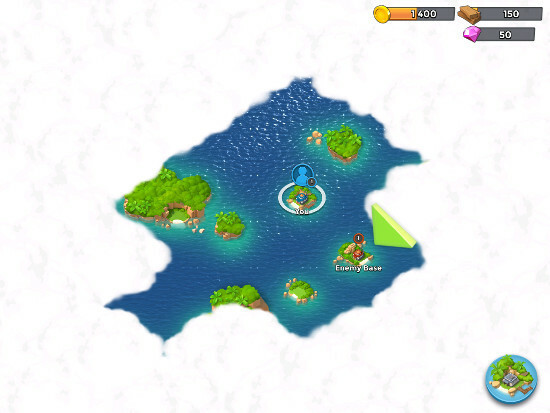 The game begins with an island base with very basic kit - a Headquarters, a House, and a Sawmill (the Sawmill is important because early on and until you reach advanced upgrades you are going to use a LOT of wood - and the Sawmill is one of the places you get that) surrounded by a forest of Mangrove trees. 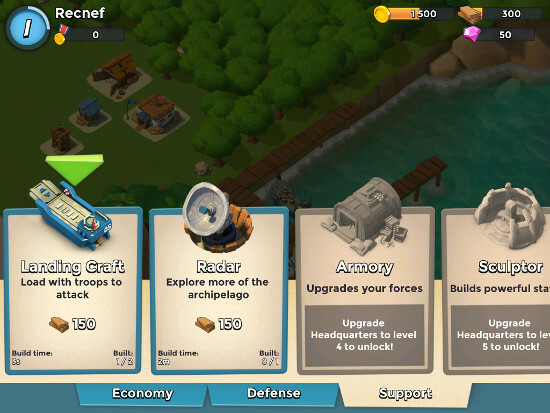 The Sawmill (and eventually an Iron Mine and Stone Quarry) offer you a constant flow of resources to use in building your base up, your defenses, and your navy and troops for offensive play. 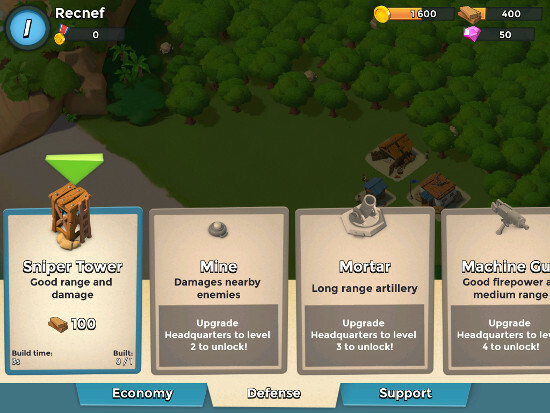 As a very basic and hands-on tutorial begins, you quickly learn the value and function for the different units, get a taste of combat, and then start to build your defenses. The world is covered by a Fog of War that takes the shape of clouds - and that Fog is penetrated through a combination of the Radar Station you add to your base and paying gold coins to reconnoiter each section. The actual combat side of things is accomplished via your naval and marine forces, which takes the form of a Gunboat that provides security and protection for your Landing Craft, and the Landing Craft, which transport your troops - which at first means Rifleman. Once you have progressed and leveled to the moderate and advanced levels, you get to add new and special units - like the Zooka Girls, Medics, and Tank Girls (Zooka Girls have Bazookas, Medics heal, and Tank Girls drive armored tanks - you get the idea). The combat system is very simple - you approach the island beach and soften up the target by using your Gunboat and its naval cannon - then you send in the LCs to deliver your troops, who then attack the enemy facilitates and defenses. 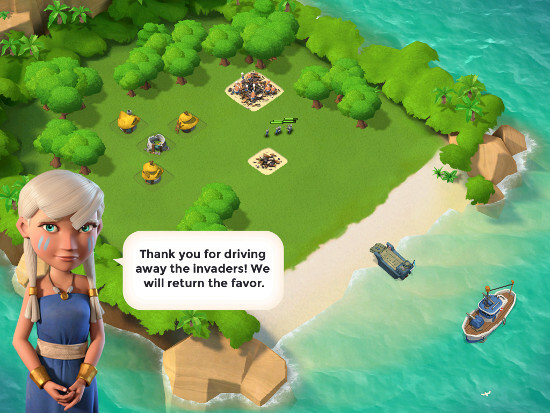 As you begin to clear the islands closer to you, you upgrade the Radar Station to see farther away, and continue the process of reconnoitering and clearing islands, all the while gaining XP, resources, and glory! Each of the enemy bases and island installations you invade and take away from them include a population of natives that the enemy had enslaved. Thanks to you freeing them, these natives begin to contribute resources to you - which they deliver to your base via boat - adding to the bonus of being the good guy and rescuing them. Among the islands you will also find rare and special Resource Bases - those being islands that are equipped with an Outpost and one of the three different resource source buildings - either a Sawmill, Iron Mine, or Stone Quarry. One of the very cool touches that refines game play is the Flare Shells that your Gunboat can fire - shells not intended to illuminate so much as to direct your forces! That's right, you can fire a flare shell at a target and all of your forces on the ground will turn and attack THAT target. If that was not wicked cool enough, there is also a medkit shell that launches an Area-of-Effect (AoE) healing cloud onto any troops in its radius! The combination of NPC and real-world player enemies makes for interesting and more important, challenging game play of a sort that constantly encourages you to continue upgrading your kit, defenses, and troops, and keeps game play fresh and interesting! That becomes especially attractive when you start to run into more and more human opponents, which requires you to create your own strategies in order to defeat them. When you first start to play the graphics are not all that impressive - they look like the sort of cartoon-style or anime graphics that have become standard for games on the iOS and Android mobile platforms after all, but once you actually get into the game you start to notice little touches and fine points that completely alters your impression of the game graphics and the world they present. Trees bend in the wake of explosions and the wind ripples the water on the sea, which itself seems to flow and ebb with a zen-like is-ness. The units seemed to be just cartoon-like representations but as you play closer attention to the details you see that they are unique in their appearance. Buildings have much finer detail and, upon inspection, there are even some interesting touches to the vehicles - like the number stenciled in white paint on the back of the Landing Craft that as it turns out is NOT the number of that LC, but rather the number of troops it can hold. That sort of attention to graphical detail allows you to assess the upgrade status of the LC without even having to click on it. And how cool is that?! After taking in all of the many fine details and surprising elements it is very clear that this was not just a game put out by a studio that is known for making this sort of game - it is clearly someone's baby, and they have given it lots of TLC in the form of a high-class and uber-quality level of production and design throughout. The soundtrack and sound effects in the game are entirely pleasing and it is clear that a lot of care went into planning out the effect they would have on the players. When you are at your base and contemplating your upgrades and its security, the music is relaxed and soothing - which we have to admit was nice when we were licking our wounds after the rare (but always possible) disastrous defeat suffered at the hands of a player-opponent who clearly had a better understanding of how to use buildings to block your path and defensive nests to dish out hurt. When the focus shifts to combat the music is fast-temp offering military-like beats and a positive backbeat almost as fast as your heartbeat. But it is the ambient sounds of nature and the sea that really impress. The waves and wind, the calls of seabirds mixed with the song of forest birds combine for a soothing and natural feel. Of course the manly cracks and booms of guns going off and explosive shells raining down also do not disappoint. As we noted previously, it is clear that this game was someone's baby and they managed to see it done right. Considering that this is a free-to-play game the price is clearly right. That said it does have a few annoying elements to it - and we are not talking about logging in to find your base sacked as that is part of the game play model. No, when we say annoying one of the major points we are referring to is the incredibly short idle timer. Considering that this is a game that is quite literally BUILT about timers that you have to wait out, we think that we should at the very least be able to wait out the timer to, say, upgrade a Landing Craft without the game forcing us to do a reload! Another short-coming we feel is present is the lack of control over resource collections. The game basically begins channeling the resources into collection stacks as soon as it feels that a sufficiently large quantity exists - but its idea of collectible quantity and ours differs considerably! For wood the game might decide that 34 units is adequate for the natives to deliver it, whereas a starting size of something like 340 units makes a lot more sense. Players who cannot resist premium currency and God-like time-skipping powers will find that there is plenty of that to draw them in, while players who have more patience and who enjoy the benefits of long-term play and planning and the gratification that comes from working for your success will also find a lot to value here. Perhaps the most significant mark to measure success by is the frequency that the game draws you in and the difficulty you have in putting it down - because in those terms this one is right up there! This is especially true from the very start, where even though you are using troops and base tech that are crude compared to the levels that you will eventually attain, there is no sense of that low-tech level in terms of entertainment levels. 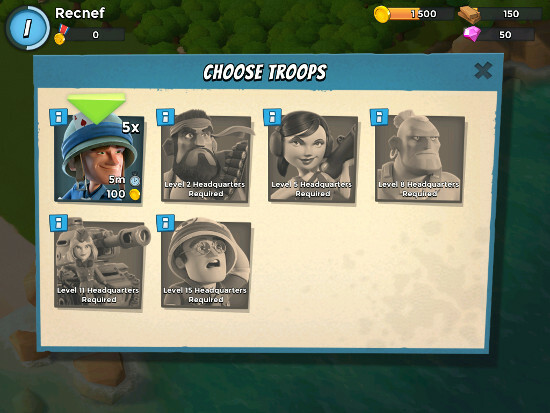 Taking every aspect into consideration, Boom Beach earned a solid and respectable 4 out of 5 and a permanent place on our game play rotation list! Welcome to the containment zone, Commander! ..